India is a land preserving cultural and traditional values strengthened by the religious beliefs. This makes its inhabitants devotional believing in one or the other religion. Hindus the major sect of the Indian community keeps faith in many gods and goddesses. Shani supposed to be the son of Surya and Chhaya and the elder brother of Yama, is one of the strongest god in Hinduism. The word Shani also means seventh day and also corresponds to the planet Saturn. There are very limited temples of Shani who is also known by the name Shanaishchara. 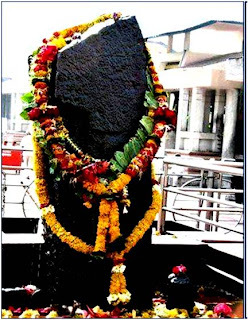 Some of the major temples of Shani are Shree Shanaishchara Koil in Tamilnadu, Shri Shani Mandir Wagholi Vasai, Shani Devaalayam in Deonar, Mumbai, Shani Shingnapur near Nashik, and Shri Shani Temple Titwala. Among these temples Shani Shinganapur is the most popular Shani temple. 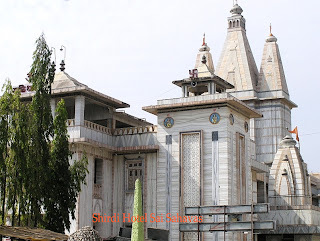 The temple of Shani in Shinganapur is located between Shirdi and Aurangabad. This self evolved idol called Swayambhu is an age old black stone idol which emerged from earth and was noticed by a shepherd from nearby village. When the shepherd touched the stone it started bleeding. On the same night Lord Shanaishwara appeared in the dreams of many shepherds and told them that the black stone is nothing but his own swayambhu form. The shepherds asked the lord about constructing a temple at the place. Shani dev declined about constructing a roof but told the shepherds to perform daily Pooja and Tailabhisheka on every Saturday. This is the reason behind not constructing a roof or a proper temple at Shinganapur. The idol of Shani is kept on an open platform. The lord also promised the shepherds that the hamlet will be protected by him from thieves and dacoits. This can be experienced even today at Shani Shinganapur village where the houses, shops and temples within the periphery of one km from the Shani temple are having no doors and ultimately no locks. On a few occasions when someone tried to steal things he died by vomiting blood. This has proved the truth in the belief and a fear of Shani Dev which keeps the thieves and the burglars away from the thoughts of attempting robbery in this village. There is a common belief that lord Shani is stricter and once he starts harassing a person the person suffers from many problems in life. To keep oneself away from the bad sight of Shani, people visit the nearby Shani temples or Hanuman temples on Saturday’s and offer an oil bath to the idol. Shani Shinganapur is visited by hordes of devotees praying for Lord Shani’s favor. It is advisable and more convenient for the devotees who are visiting Shirdi to extend their visit to the Shani temple at Shinganapur. Shirdi to Shani Shinganapur is just a matter of seventy four km and can be conveniently travelled by road. Best time to visit this Shani temple is on Saturday and the other favorite day is the Shani Trayodasi. If it is a combination of Saturday and Amavasya in a single day then it is the best time to visit Shani Shinganapur. After visiting Shirdi the most revered pilgrim of Maharashtra you can also visit the places near Shirdi like Shani Shinganapur and get the blessings of the most powerful god. At the same time you can keep yourself away from what is called as Shani Pida the bad period coming in many peoples life. We at Hotel Sai Sahavas in Shirdi will offer all guidance regarding the means of travel, your wonderful stay near Shirdi SaiBaba temple and further information on how to visit the places near Shirdi. Muktidham is a benevolent marvel at Nashik in Maharashtra, purely carved out of marble which is the most favored tourist destination in the city. This is the place where a pilgrim or a visitor is supposed to get Mukti or freedom from all the attractions as well as atrocities of life. This unique Hindu temple in Nashik was built from the whole hearted donation offered by the industrialist Late Shri JayramBhai Bytco of the popular Bytco industries in Nashik. It is located near Nashik railway station and is just seven km from the city center. The great theme behind building this temple was to accommodate the great number of Hindu gods and goddesses in a single temple complex. These premises are operated and looked after privately by a trust. Special Makrana marble was used in the construction of this incredible abode of gods, which was shaped by the artistic hands of Rajasthani sculptors, much popular in creating marvelous structures from marble. The visitors can view and worship the replicas of twelve Jyotirlinga’s which are supposed to be the places of prime religious importance. There is a mythological legend which describes the significance of these places having the explicit Jyotirlinga’s. The best time to visit Muktidham temple in Nashik is during the event of “Kumbh Mela” the popular religious gathering of saints, seers and hordes of devotees who come from different places in India to attend this important religious event. Nashik Kumbhmela is a celebration held once in twelve years, when Nashik and the surrounding area get flooded with devotees and Sadhus. Nashik is adjacent to Shirdi and the Shirdi to Muktidham distance is around 240 km. Nashik and the places near this town are worth including in your itinerary, when you are visiting Shridi the domicile of shri Sai Baba. In order to explore places near Shirdi and Nashik you can rely on our Hotel Sai Sahavas in Shirdi, where you will be fulfilled with your desires of attaining spiritual and religious goals that too at affordable tariffs. This hotel near Shirdi temple will provide every comfort to the young and the old. Due to availability of in-house restaurant and other privileges provided at Shirdi Hotel Sai Sahavas, you can concentrate totally on your religious worship. Ajanta Ellora caves display the best example of ancient Indian art in the form of paintings dating back to the second century BC. These are the finest masterpieces of Buddhist religious art available in Jalgaon district of Maharashtra. The caves are at a distance of around one hundred four km from Aurangabad and just fifty nine km from Jalgaon railway station. 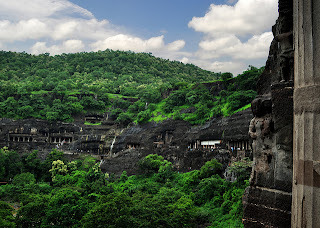 Ellora caves comprise of both Hindu and Jain temples along with Buddhist caves. Ajanta Ellora caves are carved out of the side of a cliff on the George of river waghora and are declared as UNESCO World Heritage site. Ajanta Ellora caves built between 6th and 10th centuries AD are also honored as World heritage site. These caves once lost in the span of time were accidentally rediscovered by a British officer who unnoticeable entered one of the caves while chasing a tiger. These masterpieces of architecture in the form of monasteries are having vihara halls which were used for prayers and were centered with incredible statue of Buddha in a meditation pose. These things are unbelievably carved out of hard rock. The other sections are Chaitya hall with a stupa. The entrances of caves are adorned with superficial carvings. 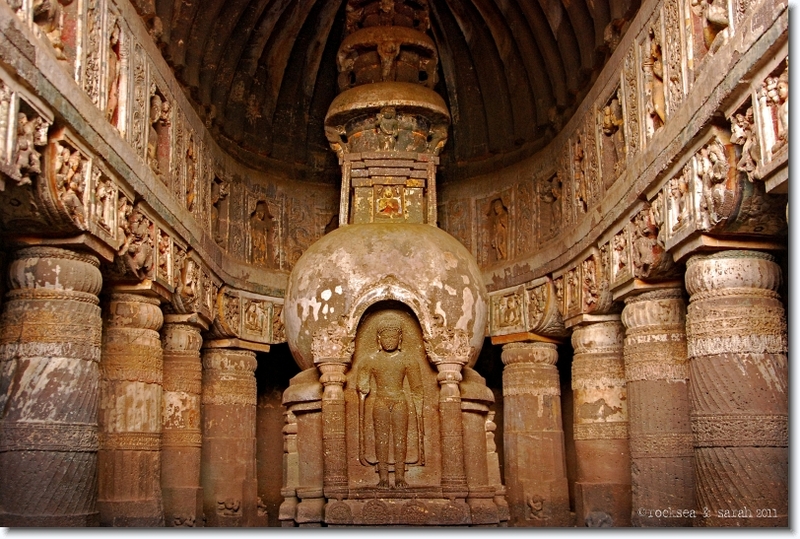 These Ajanta Ellora caves are major tourist attraction of Maharashtra. There are total ten caves in which cave number one is located on the eastern end with less damaged paintings. This cave was built by Vakataka king Harishna and his influence is seen in the art and architecture of the cave. It is also visible from the fact that Jataka tales were selected for depicting which describe previous life of Buddha. Cave number two is composed of beautiful carvings on the front side as well as on the inner walls. The scenes painted on the walls are mostly from the life of Buddha with many other beautiful designs. There are total three doorways. Other caves consist of purely devotional scenes from the Jataka stories based on the life of Gautam Buddha. Among the paintings most popular are the Padmapani and Vairapani which are bigger life size images of Bodhisattvas. 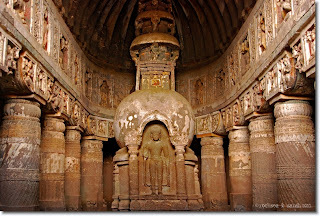 These heritage sites of Maharashtra in the form of Ajanta Ellora caves are easily reachable by road, whereas Shirdi to Ellora caves distance is just one hundred seventy four km. At Shirdi we offer most comfortable means of accommodations at our hotel Sai Sahavas located in a central location near Shirdi temple. Bhimashankar is the most popular shrine near Pune in Maharashtra nestled in the Ghats of the Sahyadri hills. This important religious temple near Bhorgiri just one hundred twenty five km from Pune keeps special importance among the twelve Jyotirlinga’s spread all across India. Along with holding a reputation of a spiritual place, it is one of the most favored tourist destination blessed with bounty of nature. It attracts hordes of tourists including leisure and adventure tourists who are interested in spending a day in the lap of nature. The dense forests of the region provide ample opportunity to view some of the beautiful birds of the region. The temple received its name from the river Bhima and the presence of Shankar in the region. Mention of Bhimashankar temple is made in the literature dating back to 13th Century. This graceful temple is the best example of Nagara style of architecture somewhat influenced by Indo Aryan style of architecture. The original temple was built on Swayambhu Lingam which was placed at the center of the basement called Gabhara. The Gabhara is surrounded by explicit carvings on the doors, walls and the pillars of the temple. These carvings and painting describe some of the incidents of the mythological legends. The temple shows close adherence to the legend of Shiva slaying down the demon Tripurasura. After the slaying of the demon lord Shiva took abode in Bhimashankar. There is a small shrine dedicated to lord Shani in the vicinity of the main temple. Nana Phadanvis the Maratha emperor built the Gopura-Shikharam of this temple. If you go to the backside of the temple you will enjoy the beauty of viewing the virgin wilderness only interrupted by the chirping or humming of the birds. Little further you will get excellent glimpses of the mountains and the forts in the surrounding region. This is the place where spiritual excellence is blended with the nature’s splendor giving rise to a paradise settled in the calm of the Sahyadris. Whenever you are on a tour of this place near Shirdi, you can take a halt at the abode of the great saint in Shirdi. Shirdi to Bhimashankar is hardly a four hours drive. Our hotel Sai Sahavas at Shirdi located near the Sai temple will prove to be a convenient place, providing you many extra services apart from the splendid accommodations and a multi cuisine food to match tour taste.